“Hello! 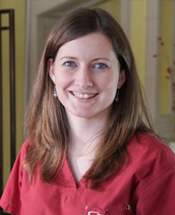 My name is Shannon, and I am the Certified Chiropractic Assistant here at Asheville Pain and Wellness Center. Any therapeutic treatment or exercises that Dr. Terri prescribes for you, I will administer with care. I have already seen the beneficial effect that Dr. Lechner has brought to this part of North Carolina. It is exciting for me to see our patients improve from the services we provide each visit, and to learn more about chiropractic treatment.